No matter what draft strategy you use, it's important to remember that you're drafting more than just a starting lineup. Having a solid, deep bench is just as important in winning that league championship, and filling the back half of your lineup with high-opportunity players is essential. That's where these late round steals come in. 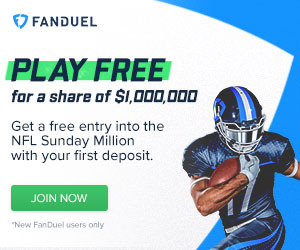 Sure, once you get past the 8th round or so it can feel like you're bobbing for apples while wearing a mouthguard, but there are a handful of players available in the late rounds who could legitimately win your league. You just have to know where to look. 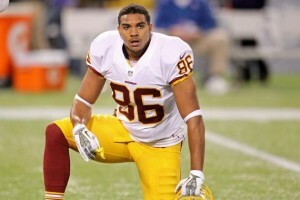 Jordan Reed puts up MONSTER numbers...when he's healthy. Reed's career reads like Nicolas Cage's IMDB page -- far too long and often stomach-churning. Washington's hyper-injury-prone tight end has never played a full season, and has only produced season-ending elite numbers once in his career. In 2015 we got a taste of what a pseudo-healthy Reed could do, as he put up 87 receptions for 952 yards and 11 touchdowns over 14 games. You know what Reed is capable of when he's healthy. Over the last 3 years he's averaged 14 points per game, numbers that are second only to Gronk. I'd much rather have that kind of player in my TE spot for 8-10 games than your garden variety tight end who's going to put up mediocre numbers all season long. And if he once again rides the bench for the majority of the season? Well, at least you didn't splurge on a tight end too early. Of all the running backs in Green Bay, Ty Montgomery possesses the most utility and should therefore see the field more than Aaron Jones or Jamaal Williams. In his first three starts last season -- his only fully healthy outings alongside Aaron Rodgers -- Montgomery averaged 14 rushing attempts and 6 receptions per game. Those are bonkers numbers for a running back. With Jordy Nelson gone to Oakland, it will be interesting to see how they use Montgomery -- a former wide receiver -- in the passing game. Could he be more of a Duke Johnson-esque player in Green Bay? That would certainly bode well for his numbers, as Johnson caught an RB11 finish in 2017. Looking for a piece of the Eagles' offense? Agholor is the guy to target. Agholor finished 2 spots above Alshon Jeffery in PPR formats last year, and yet he's currently being drafted FIVE ROUNDS LATER. Too many people consider Jeffery as the supposed WR1 in the Eagles system, but that's not how it looked to me last year. If Philadelphia's target shares from 2017 are any indication, the team seems to have no true No 1 receiver, but rather a 1A, 1B, and 1C in Jeffery, Agholor, and Zach Ertz. All three saw at least 90 targets and scooped up around 800 yards. Agholor's breakout season resulted in career highs in every major category, and it wasn't even close. Even if you expect slight regression, his WR21 finish has to buy him some leeway in the draft. 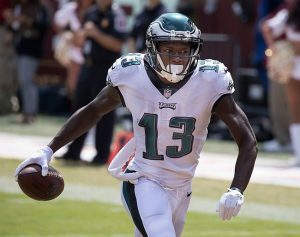 If you want a piece of Philadelphia's offense this year, I'd recommend taking the cheapest chunk in Agholor. Travis Kelce, Tyreek Hill, Sammy Watkins, Kareem Hunt, and the return of Spencer Ware. That, ladies and gentlemen, is what you call one HELL of a security blanket for a sophomore quarterback starting his first season as the headliner. His single regular season start didn't exactly signal the second coming of Joe Montana, but it was an admirable performance that showed the game wasn't too big for him. 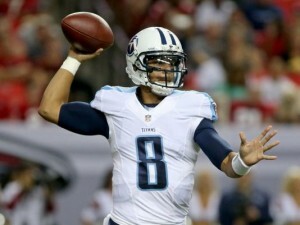 I wrote an entire article about why you shouldn't sleep on Marcus Mariota, but here's the compendium: his injured leg got better, his offensive coordinator got better, and Corey Davis got better. Mariota posted 5 games as a QB1 last year, and I expect at least that in 2018, if not a whole lot more. For those interested in the late-round QB strategy, I'd even double up on Mahomes and Mariota with back-to-back picks. You guys. C'mon. Just...just LOOK at that ADP! DJax may not have put up his usual numbers last year, but he finished 2017 as the WR45 in PPR formats. AND he only played 14 games. AND now he has another year in the system, AND a stronger connection with Jameis Winston, who seemed to miss Jackson by less than an inch on every other throw. AND you can have him basically for free. AND I'll shut up about him if you guys could just agree to stop treating him like a week-old bagel. You'd be a fool to pass on his upside this late in the draft. Want to wait on getting a tight end? Want to wait a really long time? Vance McDonald is your guy. Pittsburgh rusted him in a major way when it counted most. In the Steelers' lone playoff game, McDonald delivered with an incredible 10 catches for 112 yards. I know we shouldn't overreact to a single game, but if you were to prorate those numbers across a full 16 game slate, he'd have 160 catches for 1,792 yards. Now OBVIOUSLY that's not going to happen, but if he gets even close to half of that production, he'll be in contention for the TE1 spot. That's the kind of upside you want to chase in the late rounds.